A Liberal's Libretto: The Metropolitan Opera: Season begins with protests and the return of Maestro Levine. The Metropolitan Opera: Season begins with protests and the return of Maestro Levine. I have to be honest with you. I have grown a little disenchanted with the opera world as of late. The same singers - many of whom are "Meh" at best - trot around in productions that are trying so hard ... so desperately ... to be fresh, edgy and on trend that they fall flat on their faces ... the productions fall flat, not the singers. Maybe I'll start to feel differently soon? I mean, listen: The Met Season kicked off on Monday with Eugene Onegin ... and, a little protest outside the theater as well. In advance of the Met's opening night gala performance featuring Russian conductor Valery Gergiev and soprano Anna Netrebko [pictured at right], supporters of Russian members of the LGBT community staged a protest on the steps of Lincoln Center. Many have been calling on Gergiev and Netrebko, who have been described as "longtime and vocal supporters of Vladimir Putin", to rebuke the Russian President and the bill he signed into law banning "propaganda on nontraditional sexual relationships". "Putin, end your war on Russian gays!" a man shouted in the vast auditorium, which was packed for the black-tie gala opening of Tchaikovsky’s Eugene Onegin, before turning to two of the evening’s Russian stars: Anna Netrebko, the popular Russian diva, and Valery Gergiev, the artistic director of the Mariinsky Theater in St. Petersburg. "Anna, your silence is killing Russian gays! Valery, your silence is killing Russian gays!" Don't worry... I will spare you my opinions on the Gergiev, Netrebko, Russian gays situation... as I have already given it with great detail in a previous post. So then, there is the Angela Meade / Jamie Barton Norma coming up. This puts a sparkle in my eye. Heck ... I'd even see "A Cast" of Sondra Radvanovsky and Kate Aldrich. I mean, it's Norma after all. There's Andrea Chénier with Patricia Racette and Marcelo Álvarez. There's Die Frau ohne Schatten with Christine Goerke. There's Cosi fan Tutte with Susanna Phillips and Isabel Leonard are the sisters Fiordiligi and Dorabella, Matthew Polenzani and Rodion Pogossov are their lovers, with Danielle de Niese as the scheming Despina. An then, of course, is Nico Muhly's Met Premiere - Two Boys. Loosely inspired by real events, Two Boys lyrically driven opera explores identity and desire in the shadowy world of the Internet as a detective investigates the stabbing of one teenage boy by another ... discovering a tangled web of online intrigue. Maestro James Levine returns to his beloved Met. Above all this though, there is something that made me smile from ear to ear yesterday. Seeing this gem. 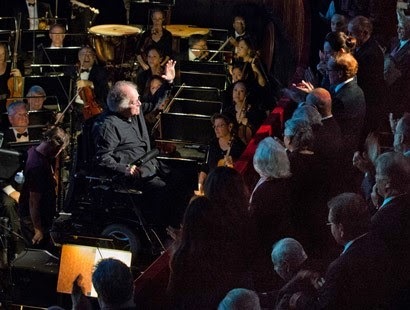 After a two year absence due to his a spinal injury, Maestro James Levine returned to the podium of his beloved Metropolitan Opera last night. His 2,443rd performance began with a standing ovation - a thunderous applause that lasted for a minute and nine seconds. He then turned his motorized wheelchair around on his new "maestro lift" and gave the first downbeat for the evening's Cosi fan Tutte. Mr. Levine stayed in the pit ... unable to make it to the stage for the bows that conductors typically take with the whole cast. The young cast was showered with applause and bravos. Then Susanna Phillips, the soprano who sang Fiordiligi, one of the leading roles, ended her curtain call by taking a few steps toward the pit and applauding Mr. Levine. The house went wild again, standing and obscuring him from the view of many. Then the rest of the cast returned, each of them applauding their conductor, who remained in the pit, and who is no doubt looking forward to his 2,444th performance at the Met.